the Union ministries for power and environment have locked horns over new hydroelectric and thermal power projects. In a meeting held in the first week of September, officials of the power ministry demanded speedy clearances for their projects. Environment ministry officials refused this, saying the projects will not be cleared if their environmental impact assessments (eias ) are faulty. 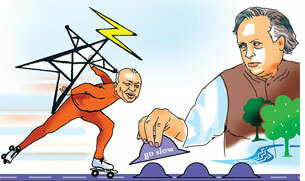 Earlier, environment minister Jairam Ramesh wrote a letter to power minister Sushil Kumar Shinde saying developers conduct eias in a very casual way.The letter dated June 30 said three public sector undertakings in particular--National Hydroelectric Power Corporation (nhpc), North Eastern Electric Power Corporation (neepco) and Satluj Jal Vidyut Nigam Limited--did not show environmental sensitivity while planning projects. Hydroelectric projects on critical rivers would not be cleared till they are comprehensively assessed for their impact on the environment, the letter said. The power ministry's demand to fasttrack clearances follows the latest Comptroller and Auditor General (cag) report that blamed lengthy environment clearance processes for slowing power projects in the Northeast. The spur came from a report of the Central Electricity Authority; it said the power ministry will have to get all environmental clearances by September next year to meet the 12th five-year plan targets (2012-2017). "Action on identified schemes need to be taken now as preparing reports and planning take time. We want the Ministry of Environment and Forests (moef) to expedite power generation, transmission and (coal) mining projects," a senior power ministry official said. The ministry has proposed 42 projects of 14,000 MW capacity on the Teesta, Subansiri and Dibang rivers. Himanshu Upadhyay, researcher with non-profit Environics, said the cag observations on moef delaying projects are out of context. " cag's mandate is to monitor where public money is going; not whether a dam should be built or not," he said. moef said the blame for delays goes to the power ministry. "The agencies executing power projects rarely approach moef in time with relevant data. They should get more efficient before asking us to process papers," a senior ministry official said. He said the eia reports of projects are full of anomalies. The cag report supports this claim. It has indicted nhpc and neepco for building power plants without evaluating geological risks. The report said the two corporations prepared project reports without relevant data. For example, when the power project on the Kameng river was under construction in Arunachal Pradesh, tunnel-boring work was started without studying the soil. As a result, the contractors were unprepared when they stumbled on trapped water, shear rocks and fault zones; the cost of the tunnel increased from Rs 31 lakh to Rs 1.28 crore, the report said. "Geological studies for most hydroelectric projects have not taken into account four decades of advances in geo-tectonic technology," said Deavashish Chatterjee, former geologist with the Geological Survey of India. He said more investigations and planning are needed in north-eastern states because the Himalayan slopes are not stable. Neeraj Vagholikar of the non-profit Kalpavriksh said many of the dams in these states are in earthquake-prone zones. Spending less on survey and investigations could render a project unviable, he warned.